Dallying In The Dirt, Issue #218--- The badly winter damaged Yew is alive. There is life, just as I had hoped there would be. Everywhere this year, including in my back yard, there is an abundance of badly burned Evergreens. Deeply frozen ground refused to provide water to the needles and leaves of evergreens when the warming sun started the transpiration process. Leaves give off water and draw fresh water from the soil as a way of pulling up the dissolved nutrients that they need. The still frozen soil refuses to supply the needed water and the needles turn a nice crispy brown colour. 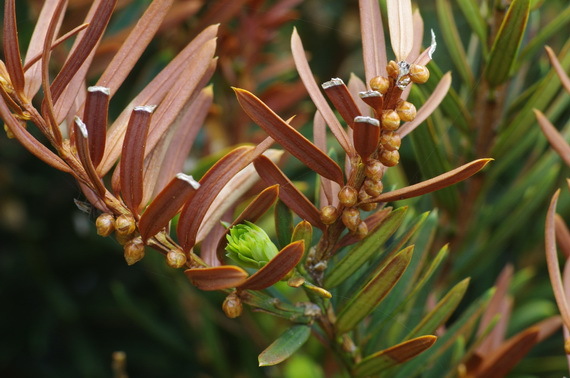 Everywhere in my very brown Yew, the dormant buds are breaking open and now there is enough available water to allow that process to happen. Search among your brittle brown branches and look for these life affirming shoots of green. Now you can prune. Remove all of the dead branches and needles back to where those new green shoots are appearing. By the end of June there will be little or no evidence of the tough winter unless some of your pruning had to be a bit severe and then some slightly misshapen shrubs may grace your yard. Eventually they will grow enough that you can prune them back into the natural or desired shape. I’m really glad I didn’t give in last week when we set high temperature records here. I questioned the importance of not planting too early. I didn’t, there were enough other chores to keep me busy and sure enough this week we had a few cool days and one night very close to freezing. The delicate flowers on my Peppers would have all fallen off and set back the production of fruit by a few weeks. The Basil would have just turned a nice shade of black. Yes there are lots of effects of global warming but moving the safe planting date by three weeks is not yet one of them. My Nematodes arrived yesterday and all 30 million of them will find new homes in the garden in the next couple of days. They don’t like to look for new homes in bright sunlight so I have to have an hour or two in the evening to set them on their quest. They will fight a variety of nasty beasts in the perennial and vegetable garden as well as the on the Camperdown Elm. While I was out taking pictures this morning, I noticed a sad looking fan of Iris leaves. 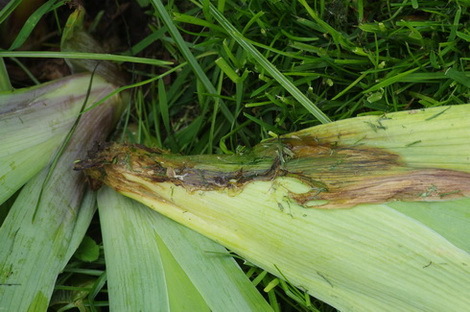 Was I really to late in stopping the dreaded Iris Borer with my nematodes? No! That fan of leaves was soft, brown and mushy at the bottom and on picking it up and giving it the smell test, the noticeably offensive odour confirmed the presence of Bacterial Rot. There is very little we can do about this problem. The rot moves in where there is a slight wound and the conditions are warm and damp. I will cut out the entire mushy section and dust the cut with powdered sulphur. It’s no cure but it will stop it from spreading to more of the plant and hopefully from other Iris in its neighbourhood. The offending material will be disposed of, not in my compost heap. This week, is the one of the best weeks to be a member of my Garden Writer’s group. In the hope of getting a lot of good press, Loblaws, (a large Canadian grocery chain,) invites us all to a wonderful afternoon event. They give us some tasty appetizers with a glass of something pleasant and show us all of the wonderful new plants they have found, to feature in their garden centres this spring. Then comes the good part, they give us a bunch of them to take home and try. They understand that most of us will not talk or write about a plant that we have not actually grown ourselves. There were several new varieties of Calibrachoa with interesting colour patterns not all of them to my liking but some I found delightful. If you live near one of their stores go and check them out, they really are the best of the big box garden retailers. What really excited me was a plant that they weren’t really promoting but one that I think is amazing. 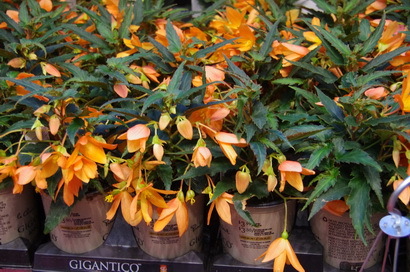 I have been extolling the virtues of Begonia boliviensis for a few years now. It’s been a bit difficult to propagate and difficult to make it branch out into a bushy full plant when it’s young. It’s amazing when it matures and provides a spectacular show of colour all summer in sun or shade. It has previously been available in few shades of red. Loblaws was showing new deep velvet red and vibrant orange varieties, both of which were freely branching and looking good even in their 10 cm (4") pots. Rush to these stores and snap up these dreams before everyone realizes what they are and they disappear from the shelves. My samples will get a place of prominence in the garden and I will continue to report to you on how they perform. Rasheed Asks? What's the best time to relocate the tulips? I have a decent combination but they are getting crowded. Ken Answers! When the foliage has turned brown and is starting to die down, dig the bulbs and replant them or store them in a cool dark place and plant them in the fall. Geryl Asks? Thanks for sharing not only your successes, but also your challenges. I went looking for my two treasured paw paw trees and found two stumps. I guess the bunnies found them to be very tasty. Rabbits also chewed my magnolia to the ground a few years ago but now I protect it. While it has been growing, it doesn't bloom very much. The picture attached shows one lonely bloom. Do you have any advice such as pruning. Ken Answers! Magnolia carry their flower buds over the winter and severe winters can do some damage. The larger trees around my area are blooming beautifully this year, however. If you are a bit farther north then it could be just cold damage. The one bloom was probably below the snow cover and thus protected from the cold. If you are going to do any pruning, now is the time so that it has all summer to develop next year's flower buds. Ingrid Ask? In your extensive gardening experience have you ever had any success with eliminating common horsetail from a garden? The Durham Master Gardeners were assisting at the Legends Community Garden in Oshawa at their open garden event yesterday. They have one entire slope adjacent to several plots covered in horsetail (Equisetum avense). The fertile stems had already disbursed their spores and the vegetative stems are invading several nearby plots. Digging doesn't seem to stop them. Any tips or advice that you could give would be appreciated. Ken Answers! Haven't had to deal with it since I left my country property several years ago. Digging is probably the only real answer but it is very deep rooted so it's hard to get it all. Hoeing it down constantly, as soon as it starts to shoot up might eventually make it run out of resources to spread with. Even when we might have thought about it, Roundup, had minimal effect. Again, constant spraying with vinegar may make it give up for lack of resources. The irony is that you are encouraging the planting of milkweed, and for good reason, but it is almost as invasive as the horsetail but easier to dig out.